The copper rooster, with his brilliant gold overlay, stood 60 feet above the city on its highest point. Shining bright, this rooster could be seen by all who passed by. 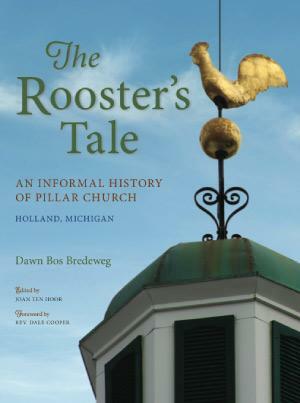 We can imagine that the rooster could also observe all the changes throughout the years, around the church yard, inside the church, and all around the Holland area. From his vantage point, the rooster saw thousands of immigrants come from the Netherlands and other countries, saw the first school built, saw people come to this church, and saw other churches begin. He watched as Hope College grew, and watched as new businesses turned the village into a bustling city. He observed firemen fight fires, and witnessed men leaving for wars, celebrations when wars ended, and veterans returning to their families. He watched migrant workers become part of the city, and observed those from the Far East join this community. History unfolded around him, the constant observer. This book gives you a glimpse of what the rooster saw of the progress and changes to Pillar Church and its congregation over 165 years. Here is The Rooster’s Tale. Read it and see how things have changed, and how they have remained the same.